Surreal Indian Village Signed Archival Print on Canvas, "Imagination I"
Recollecting the beauty of his town in the southern part of India, this painting offers a myriad of colors in perfect blend. Manjunath Wali draws inspiration for this series from Hampi, the town he calls home. Through his paintings he illustrates the contrast between the arid nature of the place with the richness of the cultural heritage, which he depicts through bold colors. Sadhana Jaipuria presents the artwork as an archival giclée print on canvas as a part of her gallery's collection. 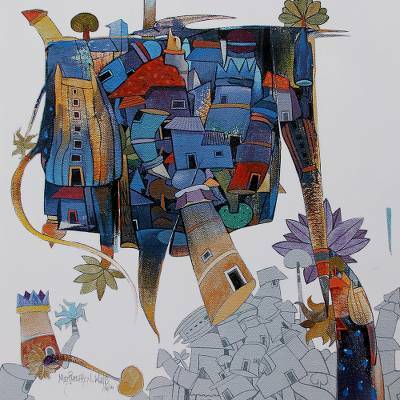 Manjunath Wali completed his Bachelors in Visual Arts at Hampi University and then went on to finish a Master's in Visual Arts from Vijaya College of Fine Art.Wali's work has been exhibited in 18 group and solo shows in various cities in India. He has also been the recipient of prestigious awards like the All India, Art Exhibition, Lokamanya Tilak, Pune in 2013 and Lakkundi Utsava, Lakkundi in 2010 amongst many others.Wali's works enjoy the pride of being housed in various private and corporate collections all over the world.